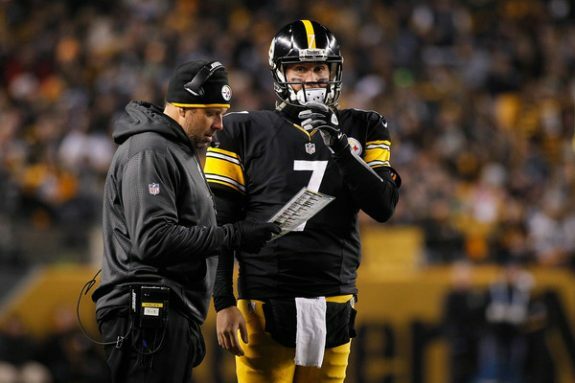 OC Todd Haley and QB Ben Roethlisberger Not Seeing Eye to Eye Again? The relationship between Steelers quarterback Ben Roethlisberger and offensive coordinator Todd Haley tends to run hot and cold, and recently Roethlisberger has been recruiting other members of the coaching staff to serve as buffers of sorts between them during games, Jason LaCanfora of CBS Sports reports citing sources. There was an undercurrent of friction palpable from Roethlisberger’s remarks in describing the instructions that were sent in from the sidelines in the dying moments of Pittsburgh’s loss to New England last week, which is reflective of the recent climate there. Sources said Roethlisberger approached head coach Mike Tomlin about a month ago and requested to have a buffer between him and Haley on the sidelines, another set of eyes and a sounding board he could turn to. Specifically, he asked that quarterbacks coach Randy Fichtner, who he is close with, no longer stay in the coaching booth in the press box during games but instead join other offensive coaches down to the sidelines. Tomlin quickly obliged, and the Steelers have been operating in that fashion since last month, sources said. What’s Wrong with Roethlisberger? Can He Turn it Around for the Playoffs? Be the first to comment on "OC Todd Haley and QB Ben Roethlisberger Not Seeing Eye to Eye Again?"